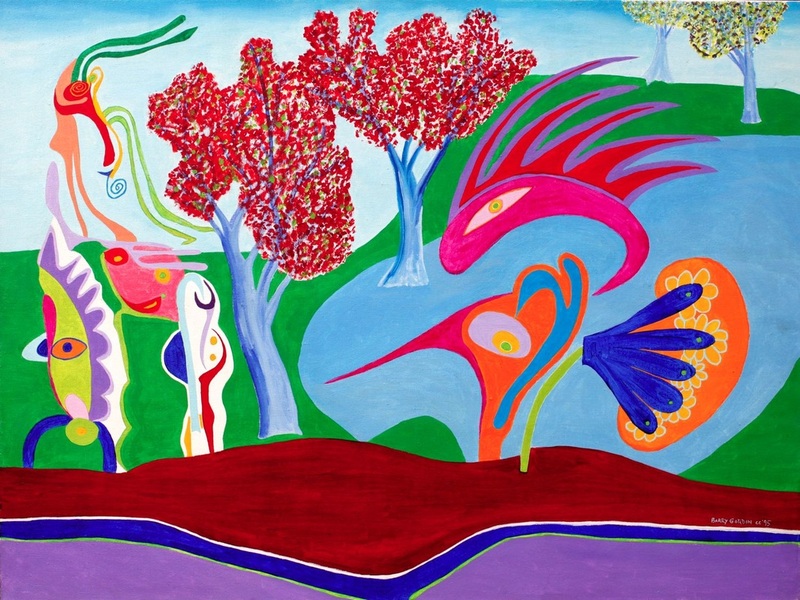 I invite you to begin the journey into the abstract surreal space of the artist Barry Gordon. My work is characterized by the use of vibrant colors and whimsical forms that grow out of recognizable human, floral or animal shapes. Abstract landscapes and vistas sometimes provide the setting for romance, confrontation or just simply a meeting. The tone is often humorous and the message frequently one of social satire, political commentary or simply an observation. I work towards a kind of musical counterpoint between color, design, composition, optical abstraction and fantasy. My work contains representations and permutations of musicians and music making; biologic and organic forms; social institutions and social relationships. My drawings and paintings center around three broad categories: perceptions of self or others; social relations between self and society, between couples and within small groups; epics and concepts. My imagery provides a broad set of opportunities for the viewer's mind to draw on their own experiential base to impressionistically develop their own conceptual/visceral "holistic perception" of a scene, a feeling an experience. What follows is an instantaneous recognition not necessarily analytically or consciously understood---ending in a reflexive interactive smile derived from the delicious pleasure of the journey.